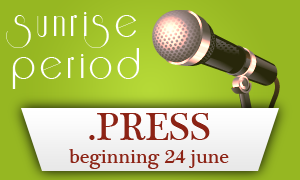 The .PRESS domain is being launched to meet the needs of global media, journalism and publishing community, entering the Sunrise phase on 24 June. During the Sunrise phase (the first 60 days), all trademark owners can register their .PRESS domain names corresponding to their brands. The Landrush phase will commence 26 August 2014 during which anyone will be able to register their generic domains by paying a small premium. General Availability phase will begin 17 September 2014 during which registration of .PRESS domain names will be available to anyone on a first-come, first served basis. This generic extension is aimed to provide a global platform for Internet users who wish to share meaningful content, from journalists, media professionals, news corporations, bloggers and publishers to PR experts. Sharing and dissemination of information will be more relevant thanks to .PRESS and will provide a new extension to influence audiences and, for press-related professions, to establish their identity and credibility online. If you are interested in registering a .PRESS domain name that will identify your needs, please click on the domain to get more information. Our Support Team is available if you have any questions or need further assistance. We are available at support@web-solutions.eu or via phone at +44 (0) 208 133 3994.